Home announcements Apple Application Applications Games Review Gem Collapse Wins Free App Poll! Gem Collapse Wins Free App Poll! For those who love puzzles, and jewels not only on their neck or arm, but on their iPhone as well – Gem Collapse wins our Free App Poll this week! This fast paced block busting fun in this action tests your skill and reflexes as you race to complete the level before the blocks overpower you. With the awesome power-ups to help you along, Gem Collapse enables users to play through numerous levels as they try their hardest to master the game. For more fun, users are able to beat their friend’s scores on the leader board and boast with their successes via sharing their achievements on Facebook! Panic Mode - as fast and furious as the name hints. 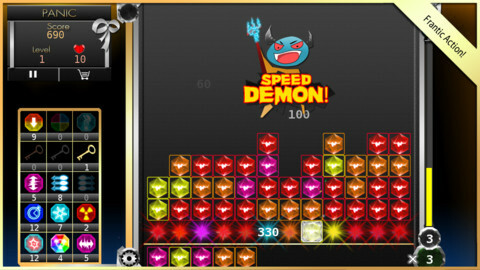 With Speed Demons, Block Storms, Frozen Blocks and the occasional Virus will all conspiring to hinder your progress, you’re assisted with the form of volatile bolts of energy, helping you to strike down from the heavens above and destroying a random number of blocks on the board. Frenzy Mode - with a whole bunch of goodies, including lucky, magic keys and frozen power ups will all appearing in the feeder. Despite having 60 seconds to grab as much as you can, it’s not an easy ride as every second the feeder will speed up and pile on the pressure! Collapse Mode - unwind and enjoy a relaxing game of block busting fun, this is the classic Collapse at its best! • Climb the leader board and share your success with your friends on Facebook. Gem Collapse is available in the Apple App Store for FREE and requires iOS 4.3 or later to be functional on your iPhone, iPod touch, and iPad. This app is optimized for iPhone 5 too.